British Airways cabin crew will stage a fresh seven-day strike from 3 March in their dispute over pay, the Unite union has said. 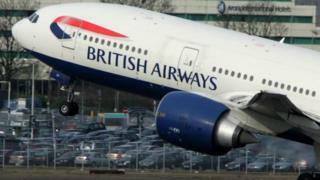 The announcement comes during a four-day stoppage by BA staff that is due to finish on Saturday. The airline said it had flown all customers to their destinations during all the strikes and would do so again. BA said once contingency plans had been finalised it would publish more details next week. Unite said the next planned stoppage will start at 00:01 on Friday 3 March and end at 23:59 on Thursday 9 March. Unite said it was clear BA could "afford" to settle the dispute after its parent company, IAG, announced annual pre-tax profit of £2bn earlier on Friday. Unite national officer Oliver Richardson said: "Striking mixed fleet cabin crew continue to demonstrate their determination to achieve a fair deal on pay in the face of British Airways' bully boy tactics." The strike, by 2,900 members of Unite, seeks higher pay for members of the so-called "mixed fleet". BA said: "Our pay offer for mixed fleet crew is consistent with the deal accepted by 92% of colleagues across the airline, most of whom are represented by Unite. "It also reflects pay awards given by other companies in the UK and will ensure that rewards for mixed fleet remain in line with those for cabin crew at our airline competitors." The airline said its offer was worth 7% over three years. Unite said that since 2010, all new BA cabin crew joined what is called "'mixed fleet", where salaries started at just £12,192 with £3 an hour flying pay. The union estimated that, on average, mixed fleet cabin crew earned £16,000 a year including allowances. BA said that annual pay was above £21,000 a year. A pay rise of 2% in the first year, and 2.5% in years two and three was rejected by Unite members shortly before Christmas. Unite has called for further talks at Acas. A BA spokesperson said: "We have always made it clear that we are willing to talk provided there is no strike threat hanging over us."